It was described as a metal plate, but I'm not 100% sure that's the case. The tactile feel, consistency and pliability would be described more like a strong plastic, almost a thinner version of a gift card, but my experience in the area is limited. While in no way definitive, my gut feeling says this is not a piece of metal. The possibility certainly exists that it is aluminum (doesn't stick to a magnet), but does anyone have any insight here? Could it feel like a thin, plastic gift card but be an actual 1962 metal printing plate? I've held/cut enough pieces of aluminum and tin to have an innate feel for metal, and this truly doesn't seem to fit that scenario. Am I just missing something? I cannot answer your specific questions but I do know that in the early or mid 1990s, a dealer sold almost the entire set in printer plate form through SCD. I used to own a couple of the checklists but sold them years ago. I have no idea where the dealer bought them from, nor do I know if there were green tints in the lot. If I remember correctly my plates were definitely metal of some sort. I have one, and it's aluminum. Some of the off feel may come from the coating on the image side, which is similar to limestone, but isn't that. There may have been plastic plates with the same coating, the place I worked only used the aluminum stuff, and I haven't really looked into when they started using other materials. _ My google skills must be improving, Plastic plates for offset lithography didn't come out till 1967. It's possible to use almost anything, the litho we did in art class was done with a plate that was paper. This looks like the same light glossy metal as the printing plates I got recently for the 1963 Topps Midgee Flags. Seemed like flimsy aluminum to me. If it’s a printing plate it should be aluminum. 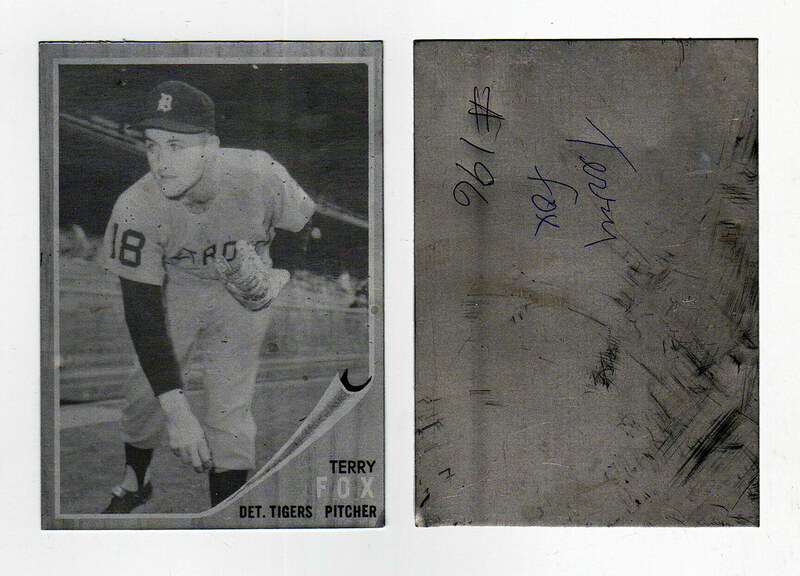 I don’t have the exact year, probably mid-80’s, Mid-Atlantic Coin Exchange was selling ‘62 Baseball Green Tint plates. I believe they had Baseball, but also Football and Hockey printing plates. I know some of the sheets were cut to individual size cards, but I’ve also seen some sheets as well. Unsure how they got their hands on them, but they are out there. Is there a non-invasive way to readily determine whether or not something is aluminum? There is. There are hand held spectrometers that can tell very reliably. But they're still rather expensive. But the better question is "is there an inexpensive non- invasive way to check if something is aluminum"
The only thing I can think of would be measuring the density. Calculate volume, weigh and compare to what a bit of aluminum that volume should weigh. It would take some accurate equipment, but it would be fairly reliable and wouldn't damage the plate. "A large find of 1962 aluminum sheets was noted in an SCD ad in the January 31, 1986 issue where Mid-Atlantic Coin Exchange was selling 1962 Baseball Green Tint plates (second series). They also had a number of 1962 Hockey plates as well. All of these had been cut from the original, larger aluminum sheets used to make the cards. However, at least two partial sheets have survived from the Hockey run"
I believe they came from a Topps printer in Hampden, Connecticut and were found at the home of a former employee there. Last edited by toppcat; 09-25-2018 at 05:30 PM. Plastic plates generally have raised areas and are not used for offset printing and they crack. This is an offset plate. We know that because it isn't reversed. What occurs is the image is transferred to a blanket and then to the paper. My experience with this printing is using aluminum. I'm not sure what process was used in 1962 however. Last edited by JTysver; 09-27-2018 at 03:00 PM. Here’s a ‘62 Topps AS that’s aluminum.